Do you worry about your pets getting lost or stolen when you’re not there to protect them? For most people who work full-time, pets have to be home for hours by themselves. Knowing that they are protected with video monitoring in Davenport can provide peace of mind while you are at work or out on the town. Here are 7 useful ways that you can improve security and safety for your pets. Install security cameras in your house. Video monitoring in Davenport is the most useful to keep pets safe and secure as much as it protects your home when you are away. What if when you were away from home burglars broke in and harmed your pets? With video security cameras, it can instantly soothe your fears and protect your pets from being stolen or harmed by intruders. Have neighbours you can depend on. While you are away for a short time, you can ask a responsible and trustworthy neighbour to help protect your pets. Your video monitoring in Davenport might be your eyes and ears, but a dependable neighbour is your hands and feet if something happens and your pet needs help right away. Find a reliable pet sitter. If your pet is too young or too old, the best way to keep him safe while you are away from home is to find a responsible pet sitter to take care of him. This also gives you peace of mind, especially when you have a new puppy or kitten. Ensure a safe and comfortable temperature at home. Make sure the temperature in the house is right for your pets so that they can live and play in a comfortable environment when you are not with them. 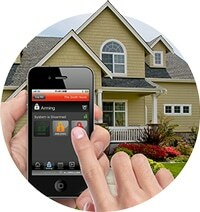 Control your thermostat with home automation. Put anything dangerous out of your pets’ reach. With video monitoring in Davenport, your pets can play in the house freely without any limits when you go out. Sometimes you don’t even notice there is something which could hurt them, like paints, cleaning chemicals and medicines. To ensure their safety, things that will harm your cats and dogs should be left out of reach. Use an alarm that has “pet-smart” sensors. Installing a pet door is a must if you want your home to be as pet-safe as you can make it. Not only will dogs need to go outside and use the bathroom, but in the case of a fire or other emergency, a pet door can be a way out. With video monitoring in Davenport, you can differentiate between your pets entering through the pet door and a burglar breaking in. Install carbon monoxide and smoke alarms in your house. Unfortunately, your pets can’t dial 911 and may not know to go outside when there is a fire or a carbon monoxide leak. Install smoke and carbon monoxide detectors which automatically alert you and emergency services. With video monitoring in Davenport, you can open doors and window remotely via your smartphone when your alarm notifies you. Your pets are part of your family, and you want them to be safe while you are gone. All in all, installing video monitoring in Davenport is the best choice to prevent tragedy. After all, aren’t your pets and home safety priceless? Call us today to get the protection you need for every family member!